The Indonesian government will ban the sale of fossil-fueled vehicles by 2040 as the country's efforts to accelerate the transition of more environmentally friendly and low-emission electric vehicles. The Indonesian Ministry of Energy and Resources said the ban would be included in the draft presidential regulation on Indonesia's automotive and transportation industries. Indonesia's move follows a number of other countries, such as France, Germany, Norway, Britain, China and India which already have a roadmap in support of the use of electric vehicles. Even these countries provide various incentives for consumers and automotive manufacturers. "A proposal for a ban on the sale of new fossil-fueled vehicles by 2040. We will propose this to the President. Hopefully it will be completed this year, "said Minister of Energy and Mineral Resources Indonesia, Ignatius Jonan, in Bali on Thursday. The ban on the sale of fossil-fueled vehicles has not been included in the draft presidential regulation, so clauses will be incorporated into the latest draft and discussed in a cabinet meeting before being imposed in the near future by President Joko Widodo. The plan for the ban on petrol vehicles has been delivered by Jonan especially to a number of vehicle manufacturers including Honda, Toyota, Mercedes, Joint Indonesian Automotive Industries (Gaikindo), and developers of electric vehicles. They accepted the ban, though proposing different times. Gaikindo proposed the ban by 2040, but Mercedes asked for it sooner is the year 2030 or the same as the German ban plan, while the electric car developers propose by 2020. Jonan also proposed the option of imported built-up electric vehicles will get tax discounts, in an effort to accelerate the use of electric cars. However, a number of automotive industry actors propose conditions such as import quotas and timeframes. The shift from fossil fuels to electric power in motor vehicles will greatly reduce Indonesia's fuel consumption by 1.6 million barrels and half of which comes from imports that drain foreign exchange at least US$17 billion annually. The Indonesian government is intensively conducting many power plant development projects utilizing geothermal, water, wind and solar. Jonan wants as soon as possible to enact regulation regarding the acceleration of the electric vehicle. "The regulation should be simple and multiply incentives so the electric vehicle industry is growing rapidly. 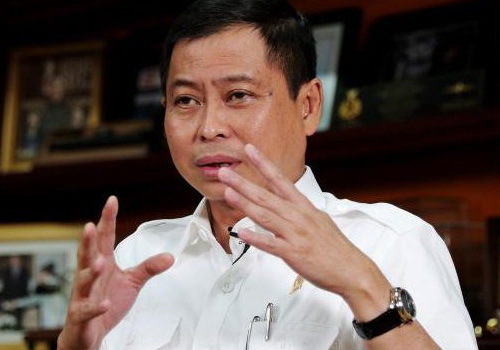 This is Indonesia's commitment to reduce pollution and the path to energy independence," said Jonan.